Does anyone have primary source evidence of the English using a buttspike on their billhooks during the Elizabethan era? Thanks in advance. Do you mean a spike at the base of the handle of a bill or other pole arm, do are you referring to the many variants of agricultural billhooks with a spike or hook on the blade??? Giacomo di Grassi encouraged having a buttspike on bills/halberds and his manual appeared in English translation in 1594. 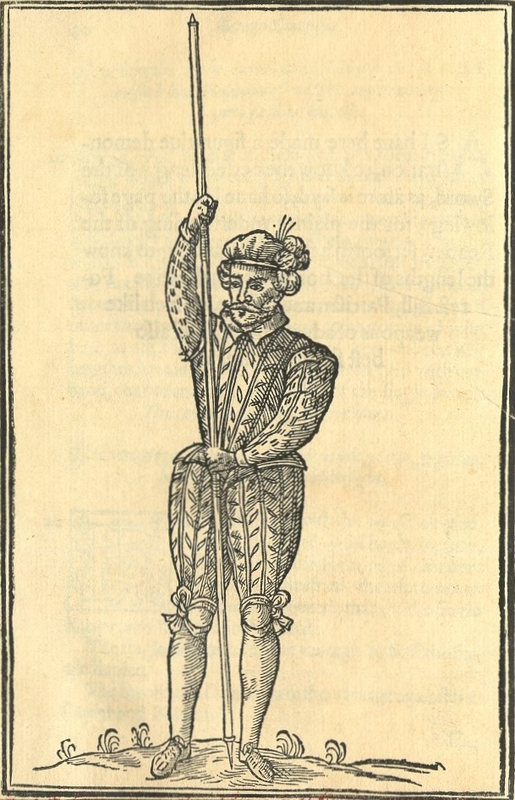 Sir John Smythe mentioned the following in 1594 treatise: "such battleaxes, or halbardes for the squadron should not be aboue 6. foot long from the top of the points to the lowest end of the little iron hoopes commonly called the Feralles [ferrules?] of their staues." It's unclear from the text if these ferrules were pointed, but we know that some were. George Silver has a clear buttspike on his short staff in his manual's illustration. Between those texts and the long English history of the pollaxe, which often featured a buttspike, I imagine some English bills had them in the Elizabethan era. Bob, I'm talking about a cap on the base of the handle that would have been spiked. Benjamin, do you have a copy of the Silver illustration? It's this image. There's a spike on each end of the staff. Hmm, perhaps I'm being too picky, but that isn't the "brownbill" or "blackbill" that Silver describes elsewhere in his work, but thank you.